Please enter the dates that you would like to visit and our cottage/ motel room availability information will be displayed. We look forward to your stay with us. We do offer 1 night stays in our motel. One night stays in the cottages are available during certain seasons and you will need to call us directly at 603-846-5553 to reserve. This wonderful 561 square foot recently renovated cottage has a Bear theme with 2 bedrooms with a new Queen size bed in each, a living room area with a gas fireplace, Heat, futon & 32" HD flat screen cable TV, a very large bathroom with hair dryer & stand up shower, closet & a full kitchen. Toaster, coffee maker, microwave, heat, AC, picnic table and charcoal grill is also included. Sleeps five with the futon in living room. Located across from the pool, area & close to playground and campfire gathering area but does have its own campfire pit. This 552 square foot renovated two bedroom cottage has a greenery theme, a new queen size bed in each bedroom, bathroom with stand up shower & blowdryer, a full kitchen & living room area with a 32" HD Flat screen TV. A coffee maker, toaster, microwave, heat, AC, heat and cable TV is supplied along with a charcoal grill, campfire pit and picnic table. Located across from the playground, horseshoes and tether ball. The pool is close by. Can sleep up to 5 persons with love seat.. This extra large 804 square foot, 5 room newly renovated cottage features 3 bedrooms with 2 new queen size beds & 2 twin beds, large living room area with a couch & 47" color HD TV plus a full kitchen. Both queen bedrooms have color cable flat screen TV. Great for a large group or family. A charcoal grill, coffee maker, microwave, toaster, Campfire pit, heat, AC, bathroom with hair dryer and stand up shower, heat and picnic table is provided . Can sleep up to seven people. Directly across from the playground area, horseshoes & close to pool. This 561 square foot country cottage has a wildlife theme with 2 bedrooms, 1 Queen size bed and 2 twins. Queen bedroom has a TV. Can sleep 5 with couch in living room. The living room has a 32" flat screen HD cable TV, heat, AC, closet, full kitchen & large bathroom with hair dryer and stand up shower adds to the interior space. A toaster, microwave and coffee maker is included. A charcoal grill and picnic table is provided outside along with a campfire pit out back. Located across from pool area & close to the playground. This 552 square foot renovated cottage is a two bedroom with a queen size bed in one room & two twin in the other. A living room with a couch & gas fireplace, full kitchen area & bathroom with hair dryer and stand up shower add to the space. 32" HD flat screen Cable TV with video hook-up, coffee maker, toaster, microwave, AC, heat, picnic table & charcoal grill are included. Can sleep up to 5 persons. Located near playground, pool, campfire gathering area & horse shoes. This cottage does not have its own campfire pit but the campfire gathering area can be used & is very close by. This large 2 bedroom (696 sq. ft.) has a unique winter theme filled with snowman with out the real snow. It is a 2 bedroom cottage with 3 full size beds, a living room with a 32" HD flat screen cable TV plus another HD TV in the 2 bed room, bathroom with hair dryer and stand up shower, full kitchen/pantry area plus 2 screened in porches with seating areas and a fantastic sunset view, AC, heat, picnic table, charcoal grill, microwave, coffee maker and toaster. Interior decor is created for a winter theme year round. Can sleep up to 6 persons comfortably. Hang out with the bear & moose in this cozy cottage with 1 new Firm plush Queen bed & seating area with,microwave,refrig., flat screen CCTV, coffee maker, blow dryer, air conditioning and heat. A great couple retreat. Picnic table and charcoal grill outside. This room has a moose theme with 1 Queen bed with refrig, microwave, coffee maker, 32" HD flat screen TV, wifi, hair dryer & air conditioning with remote control. A blue Victorian interior design with 1 new Firm plush Queen bed, couch seating area, microwave, coffee maker, fridge, heat & AC. 32" HD Flat screen cable TV. Great for a honey moon retreat or quiet get away in the White Mountains. Sleeps 2. A perfect retreat for two with a wilderness deer theme and seating area, 32" HD Flat screen cable TV,AC,heat, Full size bed with microwave,toaster,fridge, coffee maker & screened in porch.This cottage is the closest to the road with a privacy fence. Sleeps 2. 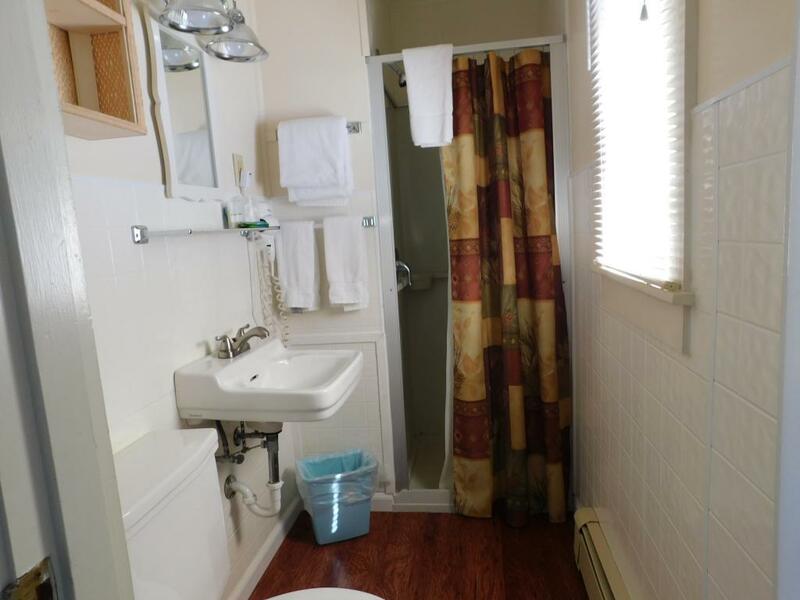 2 Double Beds with Refrig, coffeemaker, microwave, Flat screen cable TV,Wifi, air conditioning with remote control. End motel unit. A wildlife themed room with 2 Double Beds. Refrig,microwave, 32" HD flat screen cable TV, wifi,hair dryer, coffee maker & air conditioning with remote control. End motel unit. Enjoy a 2 room suite with a Evergreen theme & HD Flat screen TV in each room,microwave,coffee maker,fridge & dishes. Sofa & table with chairs. Wifi & hair dryer. Remote control AC & individual heat. There is a queen bed in 1 room and 2 twin beds in the room. The wolf in the wild is the decor in this 1 room cottage with 2 double beds that can sleep up to 4 persons along with a screened in porch area, microwave, fridge, coffee maker, 32" HD Flat screen cable TV, air conditioning & heat. 2 full Beds. Sleeps 4. This cottage is a duplex with cottage #7 & shares a large screened in porch area. Each cottage has it's own entrance, kitchenette,32" HD Flat screen cable TV, bathroom with shower & porch area.It can be used for a large family with cottage #7. Click on "view details" for more information. This cottage is a duplex with cottage #6 & shares a large screened in porch area. Each cottage has it's own entrance, kitchenette, 32" HD Flat screen cable TV, bathroom & porch area.It could be used for a large family with cottage #6. Click on "view details" for more information. White Mountain NH lodging with large family size cottages,cozy cottages & motel rooms with interior wildlife themes, Large playground area with lawn games ,heated pool,AC & cable with flat screen TV's. We are a central location to NH family attractions such as Santas Village, Clark's Trading Post, Whales Tales, StoryLand and more, hiking in Franconia or Crawford Notch, Direct snowmobile trail access off of corridor 11. Just 5 miles to the entrance of the Cog Railway and Bretton Woods ski resort. Driving up 93 North (from Boston), Drive thru Franconia Notch to exit 35, get off exit onto Route 3 North, follow 9 miles and we are located on the right hand side, across the street from Foster's Crossroads General Store. Driving 93 South , get off at exit 40 and take a right onto Route 302 East follow about 15 miles and at the light for Route 3, take a right and we are on the left 300 ft. after the Ammonoosuc River. Foster's Crossroads General Store will be on your right hand side. By Snowmobile - Follow signs into Twin Mountain from corridor 11 then follow signs for Fosters/Carroll (gas & food) and once at Fosters we are across the street. Cross the street, take a left to enter our facility. We are located close to the crossroads of Route 3 and 302.